Being a pastor is hard work. Much of what makes the pastorate so difficult is dealing with the many challenging issues people face in their lives. From marital struggles, to addictions, to significant health issues, to tragedies and heartaches of all kinds, and of course, to deep spiritual issues, the work of ministry never stops. As I was reminded this week, the calling to be a pastor is a demanding calling, one that is three hundred and sixty-five days of the year, twenty-four hours a day, and seven days a week. It is never-ending, all-consuming work. There are great rewards to the pastorate as well. In the ministry, pastors get to see marriages healed, addictions overcome, healing take place, new life come to families, lives restored, and most importantly, people giving their lives to Christ. There is nothing greater than celebrating the goodness and grace of God with the congregants in your church. Even though the work of ministry is never-ending and demanding, it is also filled with unbelievable benefits and joys. Just a few weeks ago, I was having breakfast with a church member, which I often do, and this man and I were talking through a difficult issue he was having with another person in our church. Conflict in our church is rare, but it does happen, and when it does, I seek to help church members resolve it as soon as I am aware of it. This conflict was deep and sometimes with such deep conflict, people can take the easy road and just choose to leave the church. I, of course, did not want to see this happen. Every pastor is concerned about his church members, but pastors also recognize that they cannot force people to do what is right, and sadly, sometimes people just choose to leave. Having people leave your church for no good reason, especially without making attempts to resolve things, is very discouraging to pastors. But, this man said something to me that really ministered to my heart. As we got started in the conversation, he said, “Now pastor, I just want you to know, ‘I’m not going anywhere.’” Did you catch those four words, “I’m not going anywhere?” He went on to say that he loves the Lord, his pastor, and the church too much to let anything cause him to leave. This was such a breath of fresh air to me, and knowing the desire of his heart made our conversation go much better. We talked, worked toward a resolution, and things are fine now between him and the person he was in conflict with, because they have resolved it. As I reflected on my conversation with my friend, I did not realize how much four simple words would mean to me. Sometimes when I am unsure what a person will do, it creates anxiety and has the potential to make me approach things from a more defensive perspective, but when I know that a person is committed to the Lord, the church, and the church’s leadership, it is amazing the freedom it gives my heart. When two people are on the same team, they need to be on the same page, but if you are not sure you are on the same team, it is easy to never get on the same page. There is simply something refreshing and encouraging when you know, that no matter what, a person is not going anywhere. As in all relationships, when there is deep commitment and trust, those relationships will flourish and grow. I recently went on a mission trip to New York City with twenty-nine students and adults from our church. Spring Break gave our team the incredible opportunity to serve the wonderful people of this great city. Our mission team spent much of our time in Queens, but was also blessed to see many of the other surrounding boroughs. First, Christianity is relational. We worked with several different churches on our trip, most of which are relatively new churches. The pastors of these churches face the daunting task of reaching people in the most unreached city in America. We discovered that their approach has to be about building relationships with people in their communities. All of these communities are very diverse, and each presents the unique challenge of connecting with all different types of people. As I evaluated these churches and communities, I was reminded that whether you are in New York or Newcastle, it all comes down to building relationships with people right around you. When we walked on the streets of New York, there were many “street preachers,” shouting at people. While God can use anything and anyone, most people are turned off by such approaches. But, when we connect with people personally, there is greater receptivity to the Gospel. Christianity has always been about bringing people to Christ, and the best way to do that is by genuinely loving whomever God puts in our path and pointing them to the truth. Truly, the best way to reach the world for Christ is one person at a time. Secondly, Christianity is intentional. In order to build the relationships mentioned above, life must be approached with great purpose and intentionality. I was amazed at how these pastors approach their daily life. They are deliberate about everything. From where they shop, to where they eat, to where they live, and everything in between, they are highly intentional. When you are desperately trying to reach people, every conversation matters, and therefore, no opportunity can be wasted. This is how every Christian, no matter where you live, should approach life. As I often say at our church, “Life is too short to live accidentally. Christians must live intentionally.” As Christians, our approach every day, whether in New York or Newcastle, should be that everything we do matters. What if we approached life like that? What if we were intentional about every conversation we had? The impact would be significant. Finally, Christianity is missional. The word missional means “to be on mission.” The last words Jesus gave His Church was to “Go and make disciples of all nations.” In short, be on mission. The consuming thought in every Christian’s mind every day should be the Gospel of the Lord Jesus Christ. When the Gospel consumes the mind, a missional life is sure to follow. The mission is the most important part of the Christian life, but it must be approached with great relational and intentional attitudes. However, it does no good to be relational and intentional without the Gospel. All three of these things go together, and when put together, incredible opportunities to make a difference for Christ are created. Think of it like this: a missional Christian must be relational and intentional if they want to make an eternal difference. Let that thought seep into your heart and life. If you are a Christian, how you are approaching your life? Are you on mission for Christ? Are you being relational and intentional? If not, what changes and adjustments do you need to make? Identify them and do what is necessary to be the person God wants you to be. This week, no matter where you are, seek to approach life with the right perspective. Pray for people. Love people. Point people to Jesus with your words and your actions. As you do this, watch how God uses you for His glory. Being on mission is both the greatest privilege and responsibility a Christian bears, and truly, the absolute best way to change the world for Christ is by living this way. Whether you are in New York or Newcastle, the approach remains the same: relational, intentional, and missional. This week and every week, let’s be on mission. 1. You will hear the Word of God preached verse by verse! No games, no half-truths, no gimmicks…just the truth! 2. You will see a church that is centered on the Gospel. We often say that the Gospel is what drives and unites us, and that will be evident when you visit. We never tire talking about who Jesus is and what He has done! 3. You will be challenged! There will be a call to action. Life is too short to sit in the stands. You will be called to get in the game and come make an eternal difference with us! 4. You will be welcomed! Not only will you be greeted at the door, but you will receive a nice gift with important information about the church! 5. You will be and feel safe! FBCN has an incredibly gifted security team. From the parking lot, to our state of the art check-in system for your children, you and your family will be safe! 6. You will be ushered into the presence of God through biblical, excellent, and moving music. You won’t get a concert or smoke and lights, but rather a meaningful time of worship of the one true God! 7. You will meet some of the most incredible people on the planet! The members of FBCN are amazing people: humble, gracious, passionate, servant-hearted, focused, loving, and so much more! You will enjoy the people you meet. 9. You will see that we are a multi-generational church! FBCN has lots of children, youth, and adults of all ages! From little babies to senior adults, our church has a place for everyone. 10. You will meet the best church staff on the planet! Our ministry team loves Jesus and loves people. They work tirelessly for the Lord and you will love those God has called to lead out at FBCN! 11. You will see just how much is happening at FBCN every single week. Ministries and activities for all ages, as well as mission projects all over the world, are going on year-round at FBCN. 12. You will see a unified church that truly loves the Lord and one other! FBCN is family. We do not believe the church is a building, but rather a people, and we love being together. 13. You will see a church that is alive! In a day and age when so many churches are dead, you won’t find that at FBCN! From the moment you step foot on our campus, you will see life! 14. You will discover that FBCN is just a bunch of sinners saved by grace! Yes we have a lot of great things going on, but that’s only because we recognize who we are apart from Jesus and how much we need Him! If you’re imperfect, then you will fit in great at FBCN. We are just a bunch of imperfect people serving the one true perfect God! 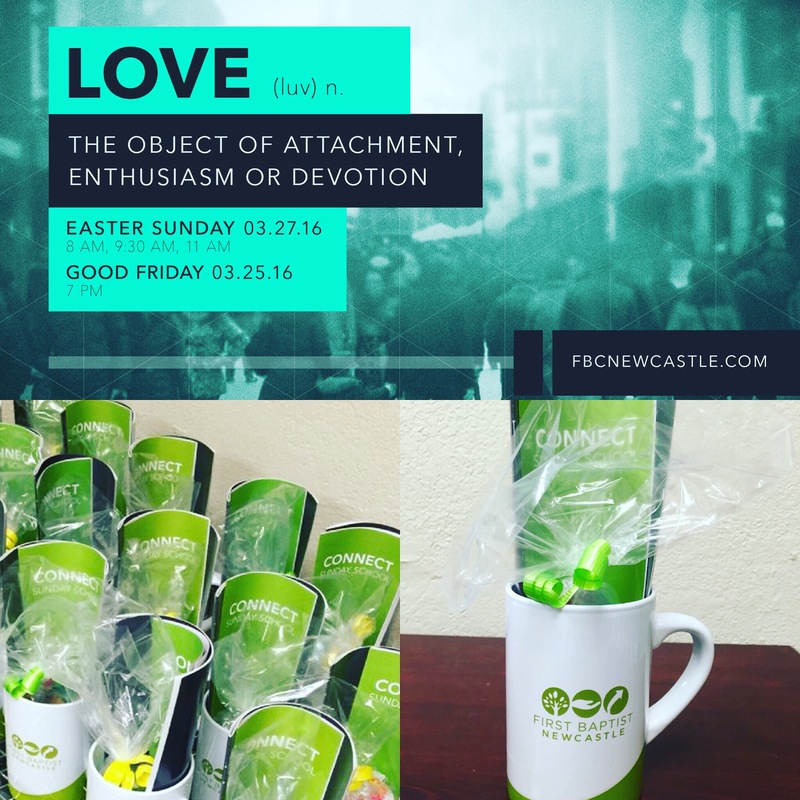 We hope you will join us this Easter! What I Learned When My Wife Left Me For Three Days! A couple of weeks ago, my wife (Emily) and her sister went to visit their grandmother in Arizona. While this was a great opportunity for her, it presented a great challenge to me. What was the challenge? Being left to tend to six children, ranging in age from 15 years to 4 months, all by myself. The very thought of this overwhelmed me and still overwhelms me, even as I write this after it has already happened. If you are a woman reading this, do not throw the paper down, or call me a whiny baby just yet. Read the entire column and then decide your response. As a pastor, I am very busy. I realize many people do not understand the demands placed on a pastor, but the pastorate is very demanding and never-ending work. I always say that being a pastor carries with it the greatest of all blessings, but also the greatest of all burdens. My wife helps me to be a successful pastor. She frees me up to do the things God has called me to. That means many early mornings, late nights, 24/7 accessibility, mission trips, etc. She has never once made me feel guilty or bad about answering the demands of the ministry. She handles much of the day-to-day stuff with the kids and truly allows me to focus on ministry. Do not get me wrong, I help in lots of ways at home, but she simply does so much I do not have time to do. I am beyond grateful for her. As she prepared to leave for her trip, the challenges of ministry did not stop, but the added responsibilities mounted up, as I had to maintain my regular duties, as well as all the things she normally does. Let me just say this, while we survived without her, I would never want to have to do that on a consistent basis. I thought I knew all the things that Emily did, but there was a lot I did not know. First, moms are a true gift from God. God has wired women so differently than men. That unique design is essential to the health of the home. Dads can try to do what moms do and be what moms are, but it is clearly not the same. There is simply no substitute for the woman’s role in the home. Both my children and I saw firsthand how much we need Emily in our lives. Second, parenting was never designed to be done alone. I have a great deal of respect for single parents and what they deal with on a daily basis, but we must remember how important it is for moms and dads to stay together. God has designed the marriage and the family in a special way, and both parents are needed. There are things I do that Emily cannot, and things she does that I cannot. Satan has attacked the family and continues to divide it. We must fight for our marriages and our homes and seek to follow God’s design for the family. Third, ministry requires me to be gone much, as do many men’s jobs. I knew this, but was made glaringly aware of how hard it is for my wife when I am gone. This reality has caused me to be more selective with my travel, recognizing the burden it places on her. I have several upcoming trips, and will be more aware of how my absence affects her, and will be more conscious of encouraging her when I am gone. Fourth, it is the little things that often go unnoticed, but are so essential to peace and harmony in the home. I normally do not think about the kids’ homework, lunches, laundry, etc. I was made aware of how many little things Emily does that I am unaware of, that simply keep things running smoothly at home. I will be more attentive as to how I can help and more encouraging to her because of what I have discovered. Finally, and there are many other things I could say, but I was made aware of how much having my wife in my life makes me better in every way. The Bible says, “He who finds a good wife, finds a good thing.” I have found one and I am hanging on to her with all I have. Emily, if you are reading this, I love you and thank God greatly for you. Recently, I preached a message from Second Timothy about the danger of having “self” on the throne of your heart instead of God. As I studied for my sermon and preached it, God spoke some tremendous words of encouragement and warning into my own heart. Here are three loves all people should avoid. Second, we are to avoid the love of things. This is called materialism and a materialistic person has the desire “to have.” The way Christians combat the love of things is with the giving of self. Jesus said, “What good does it do a man to gain the whole world and yet forfeit his soul?” He was in essence saying, “You find your life as you give it away.” Narcissism and materialism often go hand in hand. When self is in the throne of the heart, a desire for things naturally follows. The antidote for materialism is generosity, which leads to a detachment from the things of this world and a proper focus on the eternal. Finally, we are to avoid the love of pleasure. This is called hedonism, and a hedonistic person has the desire “to feel.” The hedonist says, “If it feels good, do it.” This is a dangerous way to live. A Christian does not seek pleasure, rather, they seek God, who is the source and supply of true pleasure. The way Christians combat the love of pleasure is with the control of self. As the writer of Proverbs said, “Guard your heart, for from it flows the issues of life.” The antidote for hedonism is integrity, which leads to a life of self-control and self-discipline. In our day and age, the world is full of narcissistic, materialistic, and hedonistic people. What is needed are humble, generous people, who seek God and live lives of integrity. This week, do not let anything replace love for God in your heart. Crush the love of self, things, and pleasure by putting Christ and a genuine love for Him at the center of your heart. See you next week! While I was preaching one time, I accidentally made a funny statement that my congregants will never let me forget. I made the profound statement, “If it was easy, it wouldn’t be hard!” Yes, I know, such tremendous wisdom in that statement. What I meant to say was, “If it was easy, everyone would do it,” but somehow those words did not come out of my mouth. The truth is, easy things are, well, easy, and if they weren’t easy, well, they would be hard. First, leaders lead from the heart. A quality of every leader is that they have a passion to make a difference. True leaders take action and action comes from within. Second, leaders see the big picture. One of the great differences between a leader and a follower comes down to how they see things. Leaders do not have the luxury of looking at things from one dimension. Leaders have to have vision, and vision comes from seeing the big picture. Third, leaders surround themselves with people who compliment their weaknesses. All great leaders are aware of their shortcomings, and seek to not only make their weaknesses stronger, but also surround themselves with people who make them better. True leadership is never a one-man show, but rather the collective brilliance of a team. Fourth, leaders do not compromise their integrity. Leaders lead with character and integrity. There might be shortcuts to the top, but if moral compromises are made to get there, it will be a short-lived mountain top experience. There is no substitute for integrity, and true leaders understand and live by that reality. Fifth, leaders have thick skin. It is true that if you wear your feelings on your sleeve, you will never make it in leadership. Leaders must have passion, but cannot let their feelings dictate their responses to people or situations. True leaders will never make everyone happy, and understand that criticism and attack will always come with the territory. Sixth, leaders make good and tough decisions. At the end of the day, someone has to make a decision. Leaders are not afraid to make decisions, or live with the consequences of their decisions. True leaders are not “off-the-cuff” gunslinger decision-makers, but rather make sound decisions that may not be the most popular, but are best for everyone involved. Seventh, leaders train up other leaders. One of the best markers of a true leader is that they are always looking to duplicate themselves. True leaders make other leaders. The success of any organization should not die when a leader dies, rather, it should flourish because of all the other leaders that have been trained. A leader’s legacy is best seen by his influence on future leaders. Eighth, leaders are self-motivated. No one has to motivate leaders. Leaders push themselves to be the best they can be. True leaders wake up looking for opportunities and seize them as they come forth. Ninth, leaders do not quit leading. Much of leadership is about sheer endurance. It is one thing to have a vision, and a completely different thing to see a vision to completion. When everyone else wants to quit, a leader perseveres. When others only see impossibilities, leaders find a way. Leaders press on no matter what. Tenth, leaders are servants and filled with compassion for those they lead. The greatest leader of all time was the Lord Jesus Christ. He poured His life into a small group of men who changed the world. Jesus was a leader, but He was also a servant and cares deeply for those He led. The best leaders in the world are not afraid to get their hands dirty. Leaders serve and make a difference as they lead by example. True leaders do not seek power, they seek to serve, and as they serve, they make a profound difference in the lives of those around them. Humility and service go hand in hand. Pride is often the deathnail of many in leadership. As the Scripture says, “Pride goes before a fall.” True leaders are humble servants who have genuine compassion for people. This week, seek to be a leader! There are plenty of followers in this world, and what is needed is leadership. Be one who leads from the heart and who leads by example.